I’ll begin at the beginning. I woke up and decided that I was going to be productive and go to spin class instead of watching The Real Housewives of New Jersey. I got dressed, I gathered my things, I made a grocery list, and I left my apartment 30 minutes before my spin class was supposed to start. I felt good about the day already. Then I got to the subway only to be greeted with the announcement that the next Manhattan-bound L train was leaving in 20 minutes. Psh. 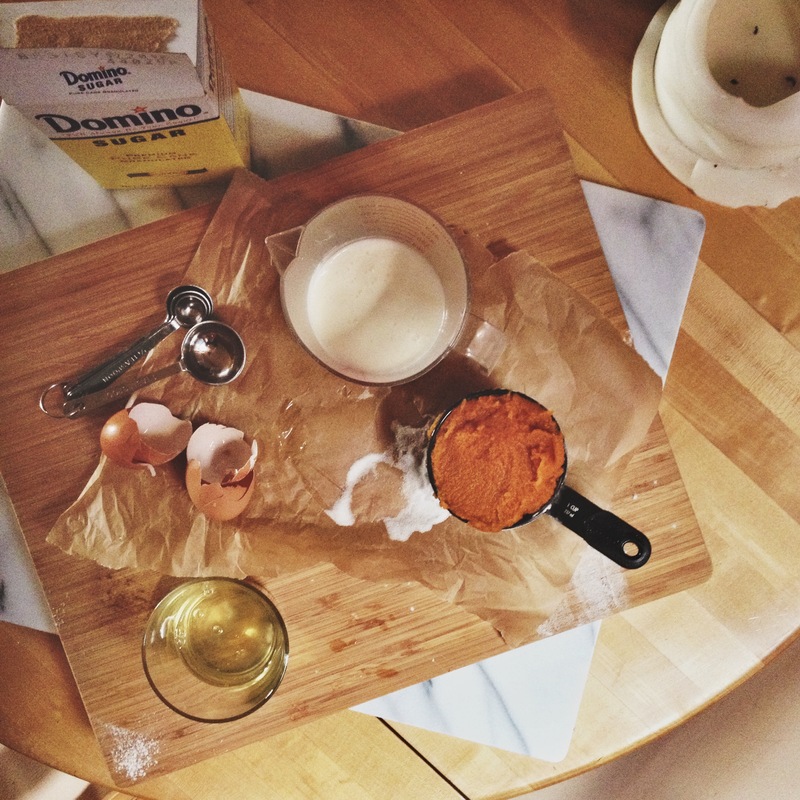 I decided I would go for a run instead before making some tasty pumpkin doughnuts. Despite that minor subway hiccup, things were going well. It was bright and brisk out so I pushed myself to run a bit further than I had planned. Feeling good and ready to head home, I turned the corner and WHAM. The sidewalk slightly sloped ever so suddenly, I stumbled, I tripped, and I was on the ground. In other words, I fell. That’s how much I love fall – I fall for the fall. After a stunned expletive or two, I looked down to see my palm bleeding and my shin scraped raw. Why is the universe so against me getting exercise, huh?? Is this punishment for the seventeen chicken nuggets I ate on Friday??? If so, that’s twisted. I was merely trying to amend my ways, Universe. After getting home, freaking out a little bit, showering, and consulting my overly worrisome parents (sorry, I was definitely not going to the hospital, Mom), my sweet roommate ran out to get me first aid supplies. 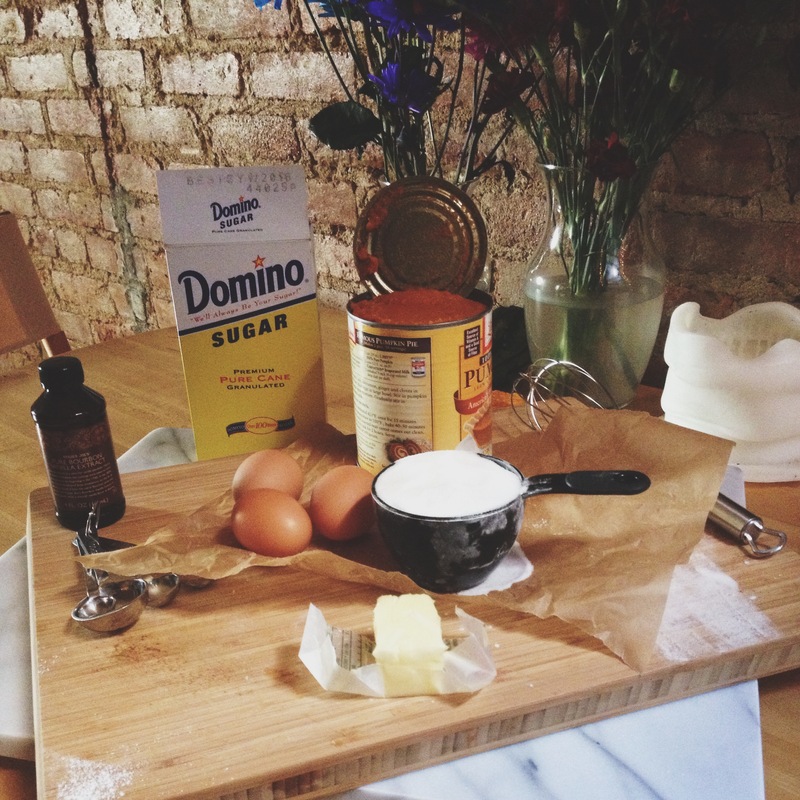 Meanwhile, I started making Ina Garten’s homemade ricotta, injury be damned. I make ricotta regularly and what better way to use up leftover pumpkin puree and heavy cream than by making pumpkin ricotta gnocchi (mmm, next week’s project), amirite? Well long story (slightly) shorter – in my injured haze I messed something up and the ricotta remained soupy and hardly thickened. Needless to say, I wasn’t feeling very confident going into this whole doughnut-frying business. Everything was going wrong! But I’d made the dough already and I’d told people I was making doughnuts. And hey, I needed the coziness that a fried pumpkin doughnut offers. Guess what – the doughnuts were great. I fried, and glazed, and dipped them into cinnamon-sugar, taste-testing along the way. Afterwards, I hobbled to the bar, escaping the mess in my kitchen for just a little bit, with a belly full of doughnuts, and I ordered a glass of red. Never has a pumpkin doughnut or a glass of wine tasted as comforting as they did after this particular Sunday. I have a few adjustments to note, but ultimately, these doughnuts are delicious, and in some cases, healing and redeeming. For the glaze, try sifting your confectioners’ sugar first and add the liquid little by little. I wasn’t happy with the consistency of the glaze and it’s something I’m going to work on next time. *To best enjoy the pumpkin doughnut making process and to add seasonal spirit, I highly recommend listening to this album, Fitcher’s Bird, from Forest Mountain Hymnal (some really talented fellow Sewanee alums). 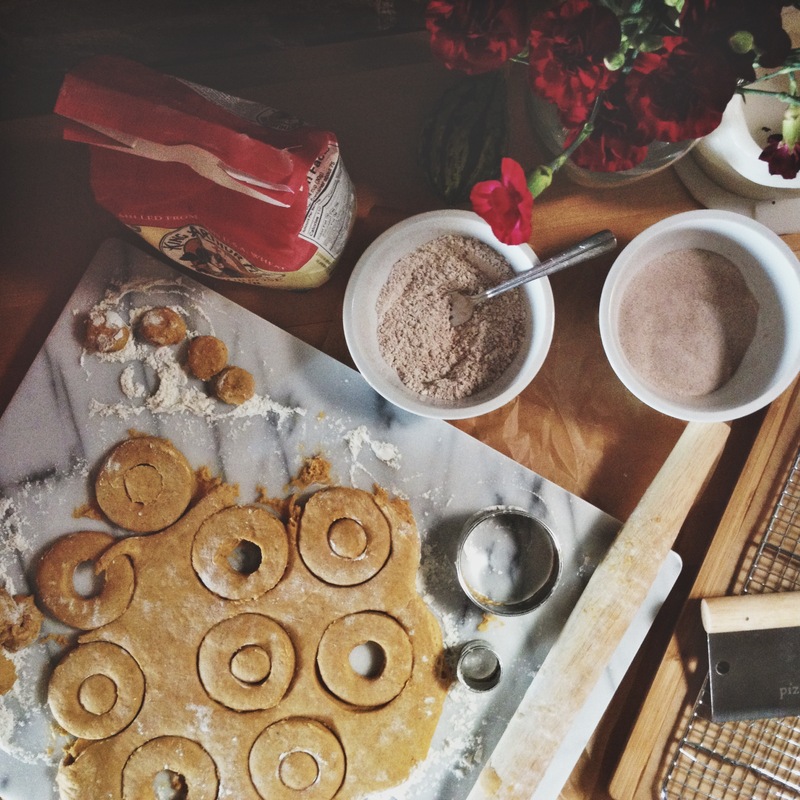 I myself listened to it several times while making these doughnuts, and then several more times while working on this post. You’ll love it. Combine the flour, baking powder, baking soda, salt and spices in a medium bowl. 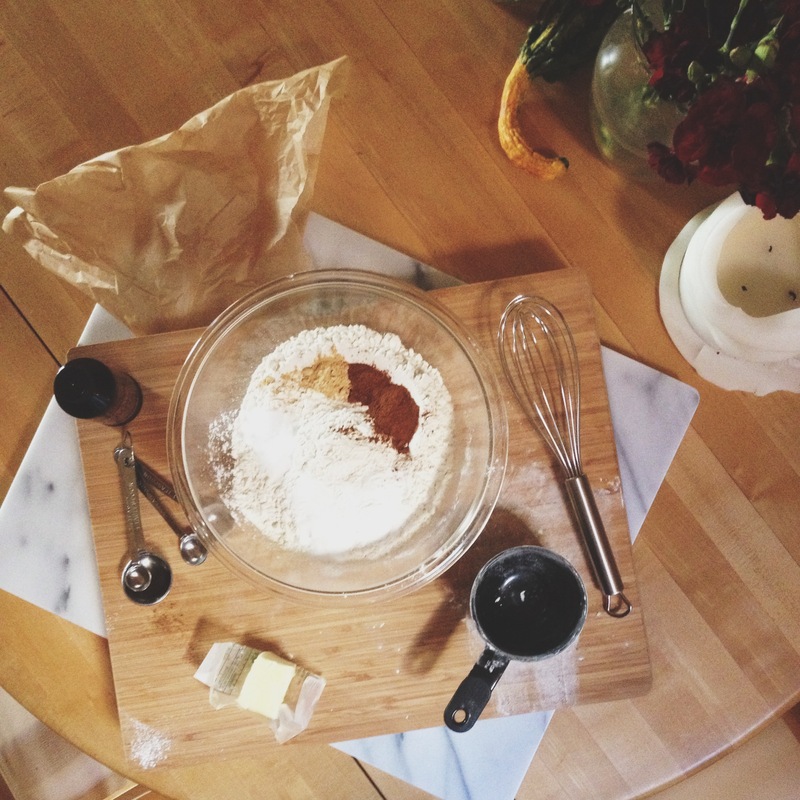 Whisk to blend, and set aside. 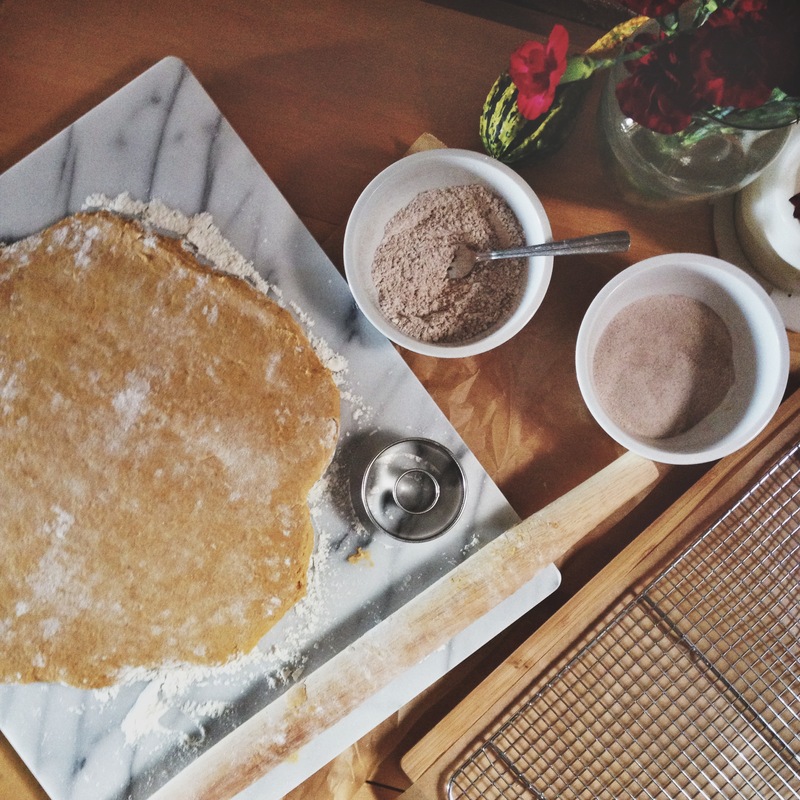 In the bowl of an electric mixer, combine the sugar and butter and beat until well blended. 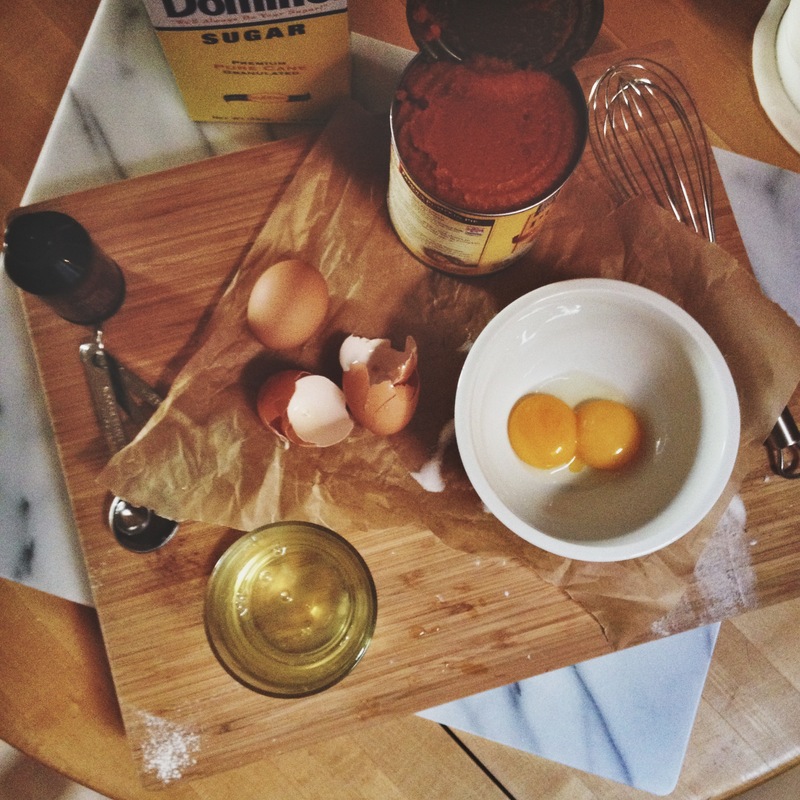 Stir in the egg, then the egg yolks, and then the vanilla until incorporated. Combine the buttermilk and pumpkin in a liquid measuring cup and whisk together. With the mixer on low speed, add in the dry ingredients and the pumpkin mixture, alternately, beginning and ending with the dry ingredients. Once the dough is mixed, cover and chill for at least 3 hours or until firm. Add oil to a large saucepan or Dutch oven to a depth of about 2-3 inches. Attach a thermometer to the side of the pan and heat the oil to 365-370˚ F.
Add the rings of dough to the hot oil so that they are in a single layer and not touching. Fry, turning once, until both sides are golden brown and doughnuts are cooked through, about 3-4 minutes total. Use a skimmer/strainer to remove from the oil and transfer to a paper towel-lined rack. Bring the oil temperature back up to the target range before repeating with the next batch of doughnuts. 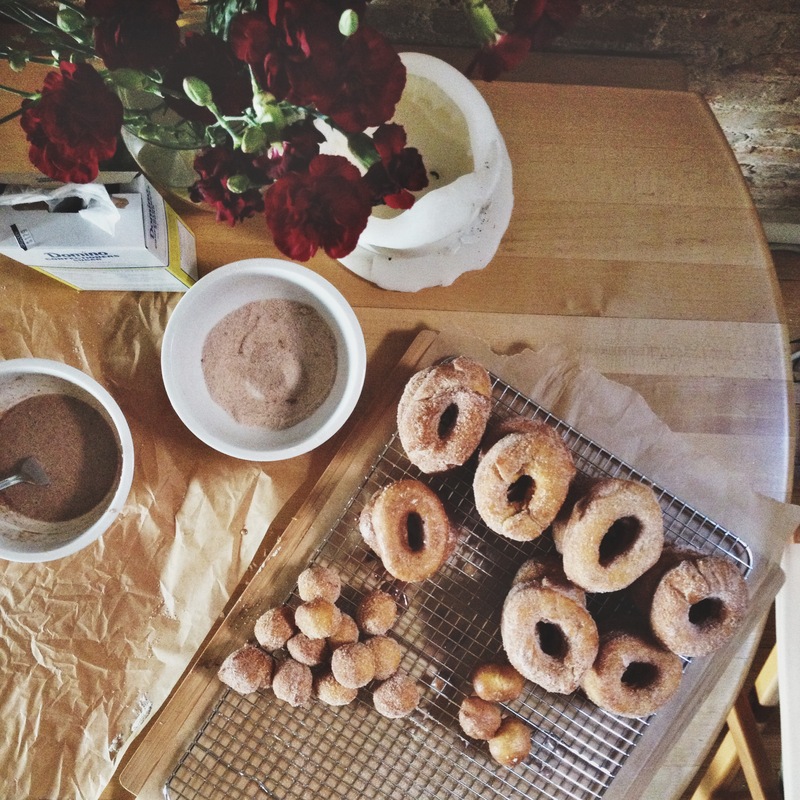 Use the same process for the doughnut holes, frying for a shorter time. To make the cinnamon-sugar, combine the sugar and cinnamon in a shallow dish and whisk to blend. When the doughnuts are just cool enough to handle, dip some of them in the cinnamon-sugar to coat completely, shaking off the excess. To make the spiced glaze, combine the powdered sugar and spices in a small bowl. Add the milk and whisk to combine, until a thick glaze is formed. Dip the rest (in other words, don’t dip in cinnamon-sugar and then dip in this) in the glaze. Allow the glaze to set before serving. 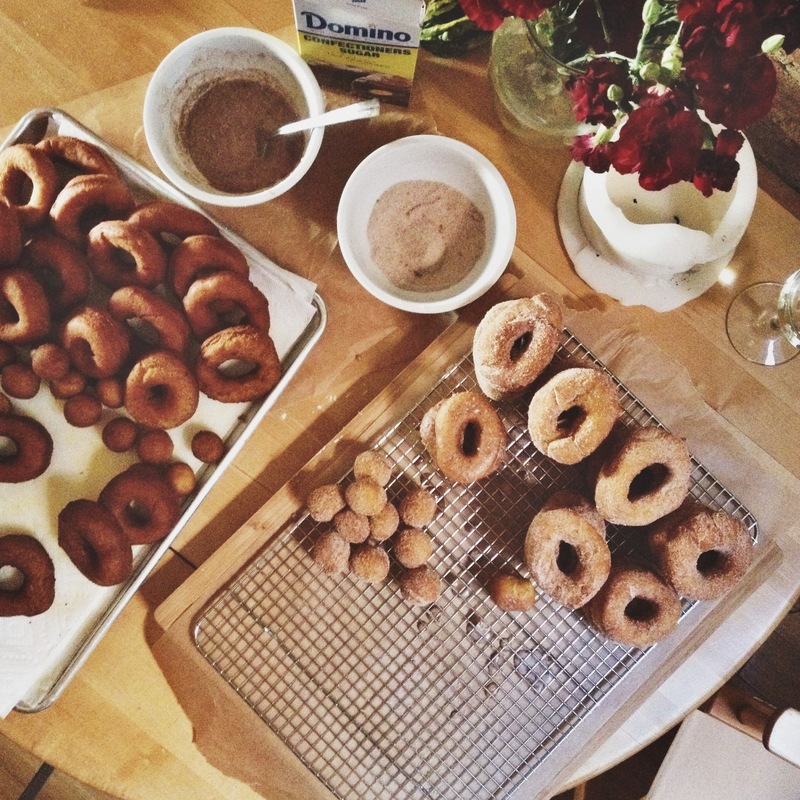 Doughnuts sound great and I’m glad you are frying them in your kitchen – not mine!